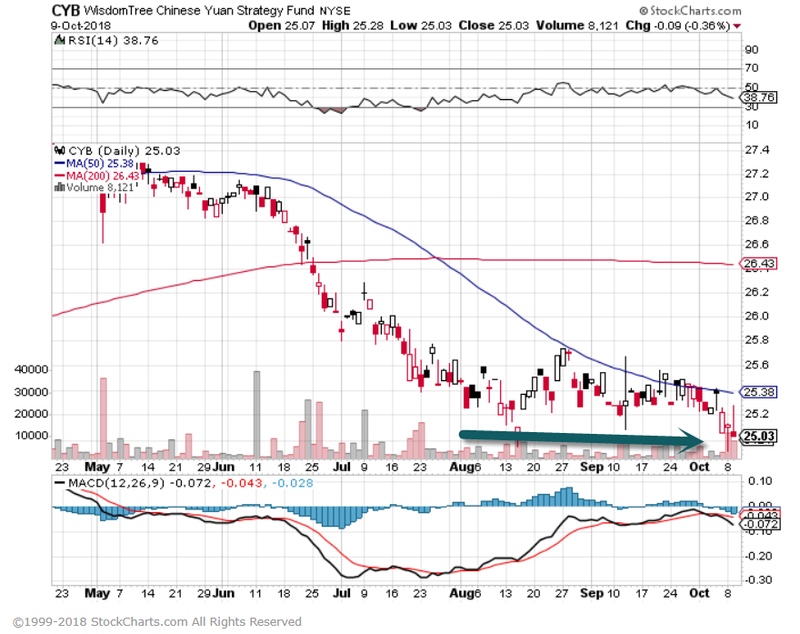 1.Interesting Comments on Market Breath….Narrow Leadership. 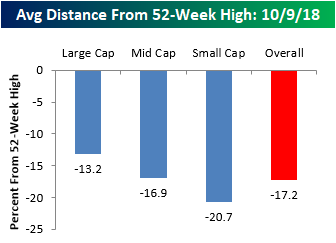 2.Interesting Look at Small Cap Risk Off. 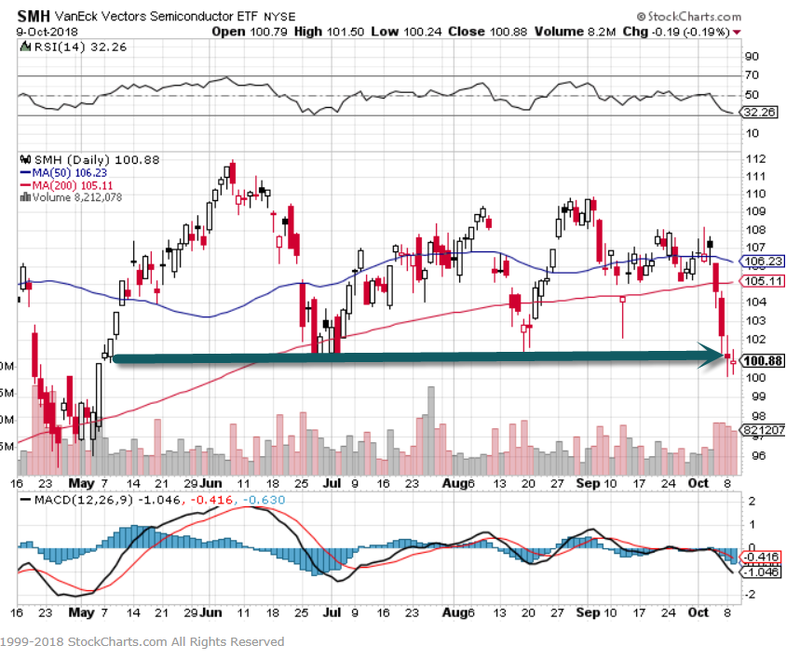 Recently small caps have sold off compared to large caps – and one potential trigger for that is likely the recent re-signing of NAFTA between US and Canada. 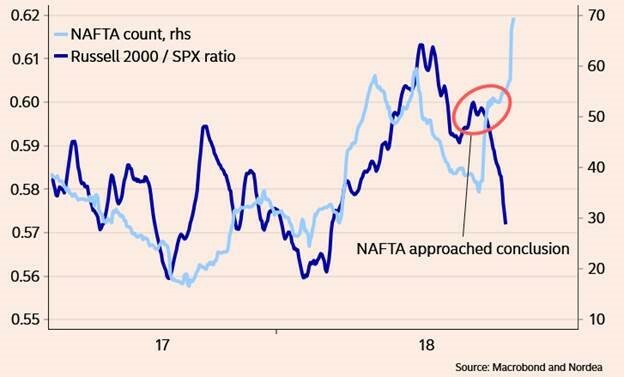 Small caps (more domestically based) have performed relatively to large caps (more vulnerable to international trade) when NAFTA tensions were the highest – now that the trade roadblock is cleared in that regards, small cap underperform again. 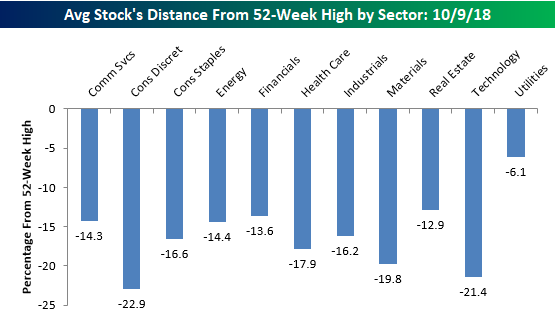 5.Interesting Indicator I am Not Familiar With…..
Nick Maggiulli, analytics manager at Ritholtz Wealth Management and the man behind the “Of Dollars and Data” blog, says it might very well sound far-fetched, but one of the best predictors of future stock-market returns boils down to perhaps the most fundamental concept of economics. 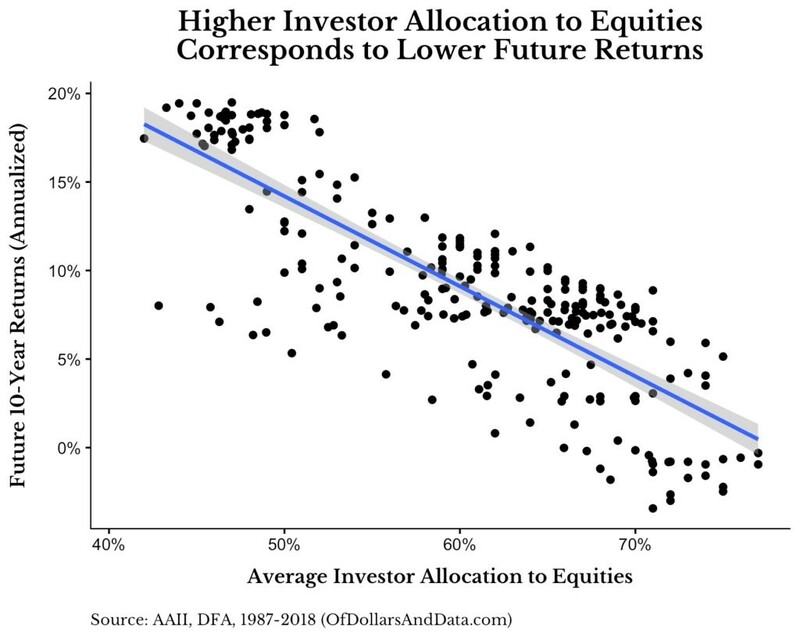 Basically, as it applies to investing, when average investor allocation to stocks is high, returns for the next 10 years tend to be low, and when average investor allocation is low, the opposite is true. To tap into that trend, Maggiulli laid out this formula: When demand gets too high (greater than 70% average equity allocation), it’s time to sell your stocks and move into bonds. 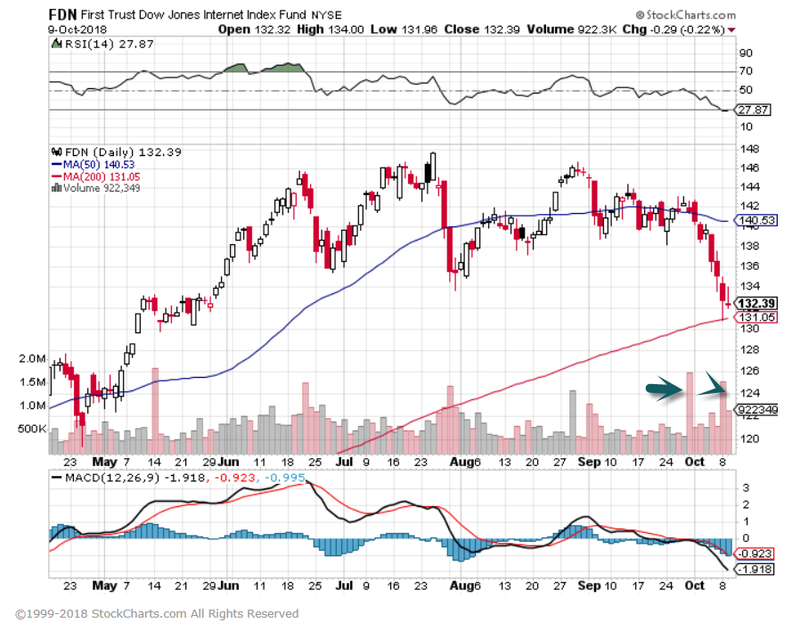 When average equity allocation dips below 50% (demand is low), then sell your bonds and buy back into stocks. 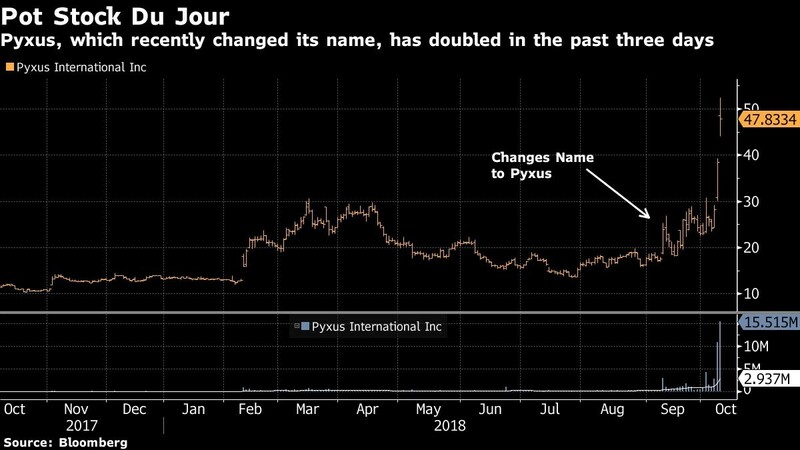 6.Remember the Stock Name Switches in Bitcoin/Blockchain…We just got on in Weed. 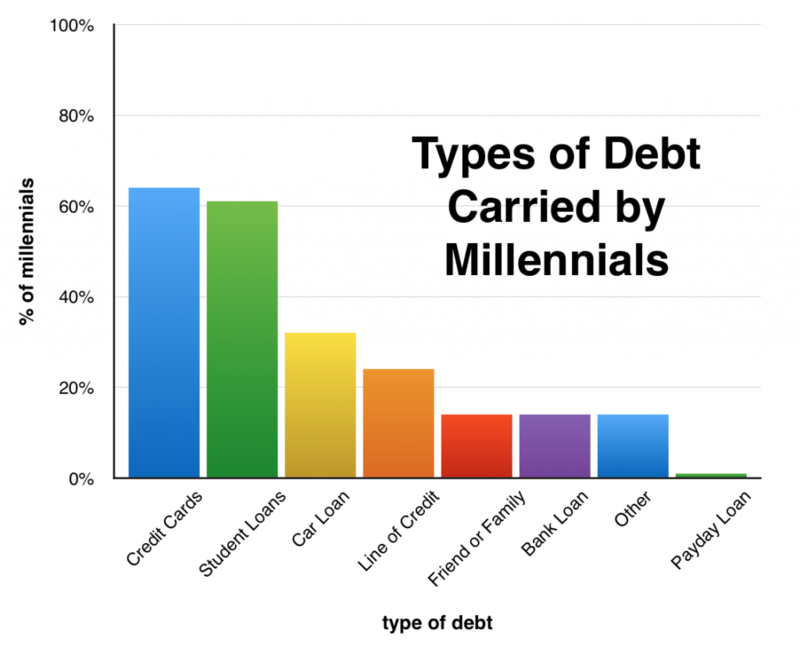 7.Millennials 30% of Total U.S. Consumer Debt. With the IT revolution at their heels, the millennial generation has a unique mindset. They are the most educated generation, yet still a good majority of them feel high-to-moderate anxiety about losing their jobs, about their level of savings, and nearly 70% worry about future income loss. This mindset has big implications for the US economy in general, and the transportation industry in particular. This is especially true because millennials, about 18-39 years old, make up the largest US generation, at 75.4 million people. And their debt totals more than $1.1 trillion, about 30% of all US consumer debt. When adjusting for inflation, this means they are the most indebted generation in American history. “Your network determines your net worth”. We’ve all heard quotes like this one. We all know subconsciously that who we associate with matters. So why is it that so many would-be high performers allow themselves to associate with low caliber individuals who drain their energy and sabotage their goals? I would argue that the reason is simple… Finding the right people to bring into your life seems like hard work. Personally, I think this is an illusion. I don’t believe it is hard to build a network of high caliber individuals if you are willing to stand up for what you believe in, live in a way that is congruent with your beliefs, and put some effort into looking. I DO believe that who you associate with makes all the difference in your life. I once heard the incredible speaker Dr. Nido Qubein describe the impact of your social network using the example of the Koi fish. “The Koi fish grows in proportion to its environment. If you keep it in a pail of water, it grows only 2 inches. But if you let it loose in the wild it can grow up to two feet,” Dr. Qubein explained. So are you like the Koi fish that has been kept in a pail or the Koi fish running the lake? Is your environment and social network stifling your growth or supporting it? You need to spend more time with positive people in a positive environment. Study after study has shown that who you spend time with will, in large part, determine your destiny. The bottom line is this. Who you associate with matters! It might matter more for your success than almost any other factor out there. To help you cut through the crap and finally create the social circle that you need to achieve your wildest dreams, we’ve put together this “Ultimate Guide to Building a Bulletproof Social Circle and Finding Amazing People”. If you’re ready to find amazing people and build the life you’ve always dreamed of… This is the guide you’ve been looking for. The first step to finding better people and building your bulletproof network is to first identify 1) The type of person with whom you want to associate and 2) Who you need to become in order to rub shoulders with a person of that caliber. Right now, I want you to think about the ideal person you want in your network and friend group. Don’t think of specific people just ask yourself what type of person you want to meet and befriend. What charities, businesses, and other groups are they associated with? What sort of character traits do they possess? As with all things, creating an empowering social circle requires, first and foremost, crystal clear clarity on what you want. This will vary for everyone based on your personal values, goals, and lifestyle. There aren’t any right or wrong answers here, you’re just trying to identify the type of people you want to bring into your life. Once you’ve taken the time to think deeply about the kind of person that you want to connect with, we arrive at the next step… Making sure that YOU possess are the kind of person who can attract these types of people. If the answer is “No” then you have some work to do. But it’s important to realize that high caliber individuals rarely, if ever, care about the amount of money that their friends are making. This is not to say that money isn’t important. Only that money isn’t a deal breaker. I have plenty of young friends who don’t have a penny to their name, but they are hustling, working hard, staying patient and disciplined and they’re some of my absolute favorite people to spend time with. You don’t need to be rich to attract good people into your life. But you do need to provide value. What are my most positive character traits? Really figure out a game plan for how you’re going to provide value to the people you want in your network. Whether you’re the center of fun and attention, the business oracle, the connector, or the young and ambitious mentee, create your social “Archetype” and get crystal clear on how you can become the type of man or woman that high caliber people want to be around. Now that you’ve taken the time to get clear on who you want in your social circle and how you can provide enough value to attract them into your life, it’s time to sit back and audit your personal social circle. Pull out your phone and go to your contacts page. If the answer is “yes” then congratulations! A lot of the heavy lifting is already done. However, your response will, more than likely, be a “no”. This is ok. I’ve been there. If this is the case, then I want you to go through ALL of your contacts (yes all of them) and even your social media connections. People who you know energize you and provide genuine value in your life. Once you’ve completed this audit (and before you go on with the rest of this guide), I want you to pull out your phone and send a message to ten of the “Type 3” people. Equally, I want you to make the definite decision RIGHT NOW to eliminate or seriously limit your exposure to energy vampires. They might be your oldest and “best” friends but that doesn’t mean they support your goals and where you want to go. Decide right now to spend no more than one day a month with these individuals (less if possible). In the era of social media, we have more connections to amazing people right under our noses than we realize. Leave no stone unturned and make sure that you are honest with yourself about where your network and friend group is today. Step 3: Identify Where Your Ideal Friends Spend Time… and Go There! Although this might be true in some cases, it is decidedly false when it comes to the art and science of building an incredible social circle. To build the friend group of your dreams and find amazing people, you must go where your ideal friends spend time. Which means that you need to get off of the couch, out of the bar, and into the locations and venues where high caliber individuals congregate. Here are a few places I’ve used in my life to find amazing people. By far the BEST place to meet amazing people. High level retreats and seminars are where top players go to improve their game and get even better at their craft. (The Perfect Life Retreat or Workshop is a GREAT example of this… shameless self plug). It’s all but impossible to walk away from one of these events without at least one amazing connection that has the potential to change your life. Every successful entrepreneur, CEO, and freelancer I know trains regularly. But they don’t just show up, putz around on the treadmill, and do some lazy curls. No, they train with a purpose. Typically a competition or event where they have the opportunity to push themselves physically and mentally. If you want to meet amazing people, I HIGHLY recommend signing up for Crossfit classes at your local gym, competing in a Spartan Race, or attending a group exercise program like F3 or Fit Body Bootcamp. With the power of social media, you can connect with anyone you want with the click of a button. You aren’t going to get very far by sending cold emails or random Facebook DM’s. Instead, I recommend that you use Instagram Direct Messages, active Facebook groups, and even platforms like Quora to connect with amazing high level people. One of the best ways to connect with other amazing people is to use your existing network! Despite what you might think, you are probably only 3-4 points of connection away from ANYONE you might want to meet, from Tim Ferriss to Tony Robbins to Elon Musk. Check out this quick video I put up a while ago to learn my fool proof formula for connecting with ALL of your heroes and ideal friends. The bottom line is that amazing people ARE out there. You just have to be creative and put yourself in a position to find them. In the same way that you will never find your dream partner by sitting on the couch and binge watching Netflix you will NEVER find good people without getting outside of your comfort zone and actually putting yourself out there. Remember, this takes time. But if you’re willing to put yourself in the right places, I promise you will have a blossoming social circle in a very short amount of time. Meeting and interacting with high level people isn’t enough if you want to build and maintain strong friendships with great people over the course of years and decades. You must provide real and tangible value to everyone in your social circle on a regular basis. Think about it like a romantic relationship. Once you’ve found the dream spouse and said “I do” your work has only just begun. If you stopped providing value, saying “I love you”, going on dates, and spending time together, you’re signing up for a nasty divorce and will likely be on the receiving end of some flying dishware. The same is true of your social circle and network. This isn’t something you can simply “set and forget”. It takes conscious and consistent effort to maintain and nurture these relationships and ensure that you and everyone inside of your network is providing value and helping one another achieve their biggest goals. Luckily, with a few simple tips, you can easily stand out among your peers and establish yourself as the “Go to” guy or gal inside of your network. I don’t mean that you have to send a daily message to each friend. Simply that you should make a habit of sending one value-driven message to a friend or connection each morning. Something as simple as, “I’ve been thinking a lot about you recently. Just wanted to let you know that I’m here to support you as you pursue xyz goal” is more than enough. I personally try and send find 1-2 cool resources (like videos, blog posts, or events) and send them to people in my social circle who I know would benefit. If you get in the habit of providing value to your friends on a daily basis, you will build tremendous reciprocity and quickly earn their respect and admiration for years to come. If you follow the steps I’ve laid out above, you are GOING to meet dozens (even hundreds) of absolutely incredible people. People who need to know one another and who could benefit tremendously from a relationship. I’ve helped dear friends make important hires, find coaches, and even meet future girlfriends and boyfriends simply by sending a quick email connecting two people I respect. Always be on the lookout for ways you can provide value through connection. You never know when one email will change a friends life. One of the best ways to provide value to your network and become the “Go to” person inside of your social circle is by hosting epic mixers on a regular basis. Become the center of positive emotions and experiences for your network. Host amazing events where you offer great food, live music, and a chance for your friends to unwind and meet other people in your network. With a little bit of practice, these events will quickly become the highlight of your year and you will be staggered by the value they can provide once you get the hang of things. There you have it! The definitive guide to meeting amazing people and building a bulletproof social circle. With the strategies I’ve shared with you, you know have everything that you need to go out and build a social circle filled with the best people on the planet. The execution, however, is up to you. If you have any questions, comments, or thoughts about building your bulletproof social circle, let me know in the comments below and I’ll do my best to get back to you! Use this millionaire-vetted Morning Routine to expand your social circle and accelerate your success TODAY!